Fatal Frame is a series that seems like it’s been waiting over a decade for the Wii U console to come along. The esteemed horror games that have players fighting ghosts by taking their picture seem tailor-made for the system’s Game Pad, which allows players to hold the controller like a camera as their character does in the game. However, while it has great atmosphere throughout, actually busting ghosts is where Fatal Frame: Maiden of Black Water, like a panicked victim in a horror movie, stumbles. 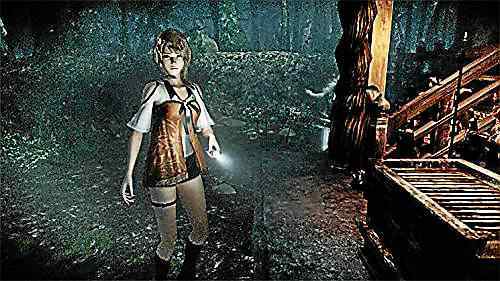 The Fatal Frame games feature an assortment of protagonists picking up the Camera Obscura, an antique camera with the unique capability of photographing and subsequently exorcising malicious ghosts. The story of Maiden of Black Water follows a group of people drawn to Hikami Mountain, a place where people go to commit suicide, similar to the real-life Aokigahara Forest. The three playable characters in the game take turns as protagonist in different chapters of the narrative, each with their own specialties when it comes to fighting the spirits of the departed. You’ll alternate playing as Yuri Kozukata, a young spirit medium, Ren Hojo, an author researching the occult, and Miu Hinasaki, a girl searching for her mother. While they all play a little differently, you could be forgiven for forgetting them, as each character has such a wooden personality and forgettable dialogue it’s hard to recall any outstanding moments in the story. During cutscenes the characters talk haltingly and in whispers to each other, and they do seemingly stupid things that land them in danger. Though the game tries to draw on classic Japanese horror themes, it executes the creepy atmosphere much better than the personalities. That atmosphere is the real star, dropping the player quickly into decaying mountain shrines, foggy forests, and flooded caves. The feeling of dread was real as I played this game by myself, late at night. Characters periodically experience unsettling visions of those who died taking their own lives, complete with a black and white film grain filter. Navigating the labyrinthine forests of the mountain felt disorienting, even with the map on the Game Pad to help. Reaching out to pick up items is a tense moment, as occasionally a spectral limb will reach out and grab you. But more often than not, you’ll expect a ghost to jump out and nothing will appear, not even allowing you a break in the tension. One area of the game had me walking through a flooded, claustrophobic shrine full of creepy, child size dolls, some of which spring to life when your back is turned. The speaker and vibration on the Game Pad are used effectively to layer on the atmosphere, letting you know when ghosts are near and when one is about to attack you with vibrations and eerie ringing noises. At that point I had to take a break and turn some lights on. However, all the tension built up before you see the ghosts is deflated when it comes time to actually fight them. To effectively banish a ghost, you need to photograph them not once, but sometimes dozens of times. Will-o-the-wisp-ish ghost particles orbiting the specters need to be framed along with the main subject in order to do maximum damage, which necessitates doing a lot of walking backward from a ghost to try and get every spirit together in one shot, like an undead family photo where all the children won’t stop fidgeting. The fights against major spectral entities seemed to drag on, going through massive amounts of film before the dead would be forced to dissipate. At first, holding the Wii U Game Pad at an angle to get multiple targets in a shot seemed like a cool feature, but since you won’t want to be holding the Game Pad out in front of you at all times, most of your shots will end up looking like lazy, awkward selfies. Giving the player a physical analogue to the Camera Obscura seems like a genius idea, but the combat is much harder as a result. I can’t help but think the fights would be more enjoyable if they could be wrapped up quicker. Maiden of Black Water is a download-only title, so the only way for English speakers to play it is by downloading it from the Nintendo eShop. However, the game does feature a convenient “free-to-start” option. Players will be able to download the first two chapters of the game to play through before deciding whether or not to buy the remainder of the game. It functions similarly to a trial version, which is not unheard of, but is relatively new territory for Nintendo-published games. The full version of Fatal Frame: Maiden of Black Water is available on the Nintendo eShop for $49.99. Nintendo provided a download code for the purpose of this review.